A multi-channel marketing campaign that taps into the complex psychology of hedge fund managers, successfully promoting our client’s data analysis tool to traders who have different investment styles. 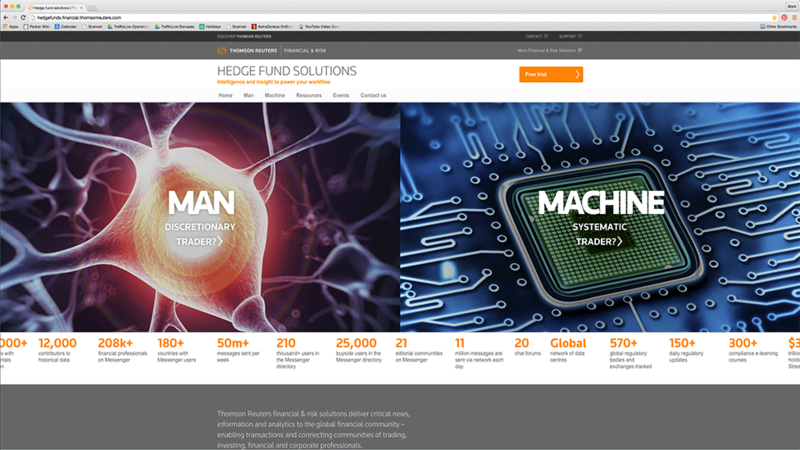 Thomson Reuters needed to raise awareness in the UK about Eikon – a software tool designed to help hedge fund managers effectively analyse market data in real time. Although the industry offered other analysis tools, the product could be specifically tailored to match the preferences of traders with different investment styles. This key differentiator provides hedge fund managers with an edge, something our client wanted to raise awareness about. Traders typically fall into one of two trading categories: Discretionary and Systematic. Our multi-channel marketing campaign needed to drive organic traffic to the product’s website by promoting the software’s ability to adapt to both kinds of investor. We devised a strategy designed to tap into the complex psychology of traders by playing up the differences between each investment style – ‘Man versus Machine’. The multi-channel marketing campaign targets individuals based on their preferences, and leads audiences on a unique journey that outlines product benefits, based on whether they’re guided by instincts (Man) or data modelling (Machine). A Target Group Index (TGI) analysis revealed key insights about where and how hedge fund managers consume media. This data established the foundation for our marketing strategy, and helped outline a customer-centric approach that was unique for our client: shifting from the company’s typical proposition-focused marketing towards a more integrated offering. 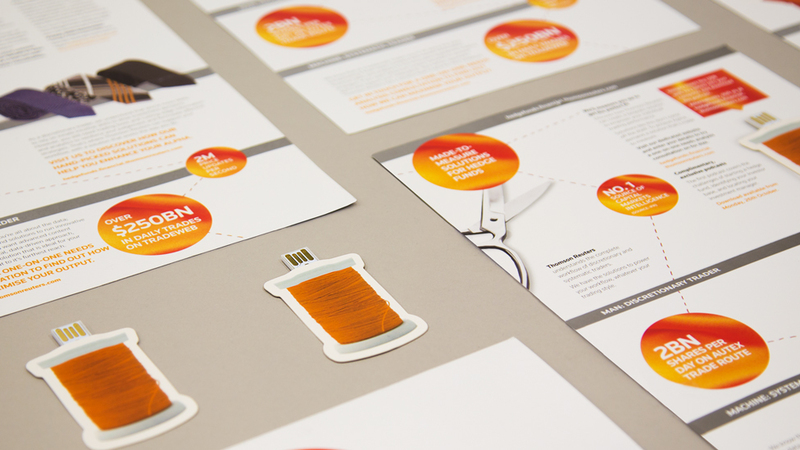 The campaign included a microsite, podcast series, direct mail, email, programmatic banners, and social media. 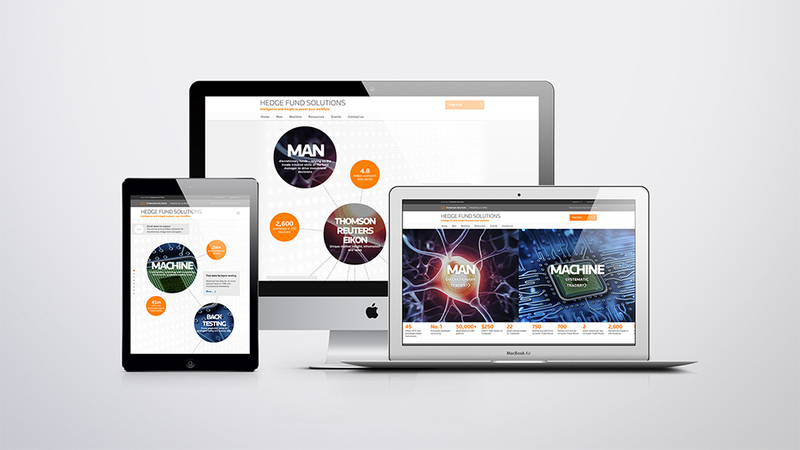 Every element of the campaign was built to work together to increase product awareness and provide direct way to access the Man vs. Machine microsite. Microsite – The product microsite is the centre of the multi-channel marketing campaign, with all elements designed to drive traffic and attract attention to this one location within a 6-week timeframe. Once engaged with the website, hedge fund managers would have a wide range of opportunities to learn more about the product. Podcast Series – Given the sophisticated nature of the target audience, we needed to engage them by providing regular quality content. Based on findings from the TGI analysis, we knew that a series of podcasts featuring recognised industry experts speaking about topical financial and investment issues would hook audiences immediately. The host for the entire podcast series was one of our client’s internal experts, positioning the company as a though leader with access to leading industry professionals. 81% increase in monthly website traffic throughout the campaign period. 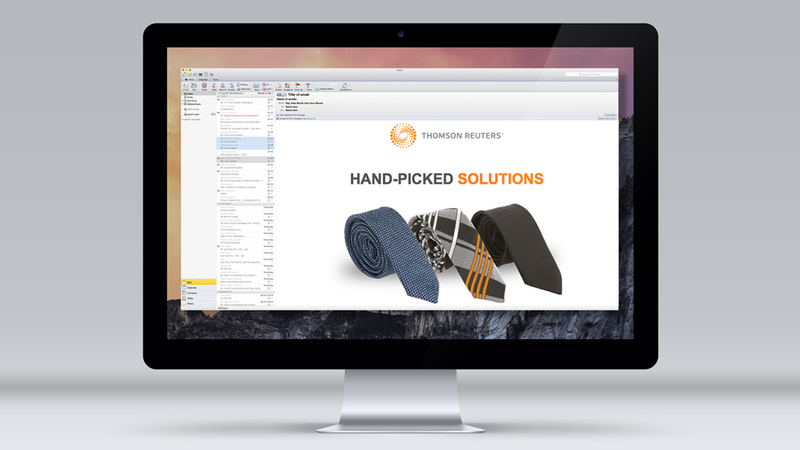 9.5% click-through-rate from direct mail web keys and direct traffic to the microsite via URL. An above benchmark click-through-rate of 0.07% and a 7% average conversion rate for digital banner ads. 624,866 impressions on LinkedIn / 26,429 on Twitter. 349 unique plays and 187 unique downloads on podcasts. We recorded and produced six episodes of the ‘Man vs. Machine’ podcast, with weekly releases throughout the duration of the 6-week campaign. All episodes in the series were housed on the product microsite. 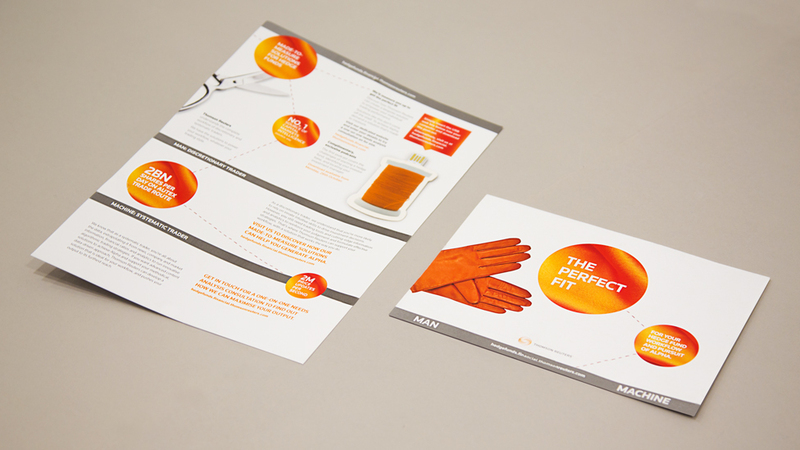 Direct Mail Campaign – We designed three stunning direct mail pieces, which were sent directly to hedge fund managers every other week of the campaign. 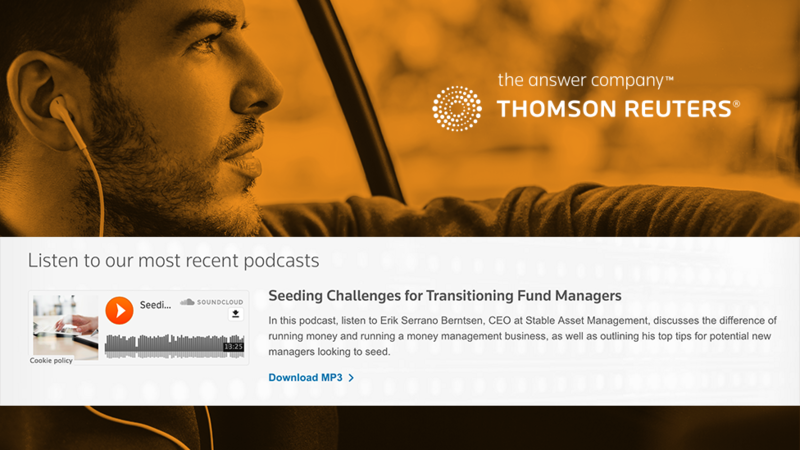 The first included a bespoke web key that linked directly to the Thomson Reuters microsite, and each included updates on the latest podcast episode available online. 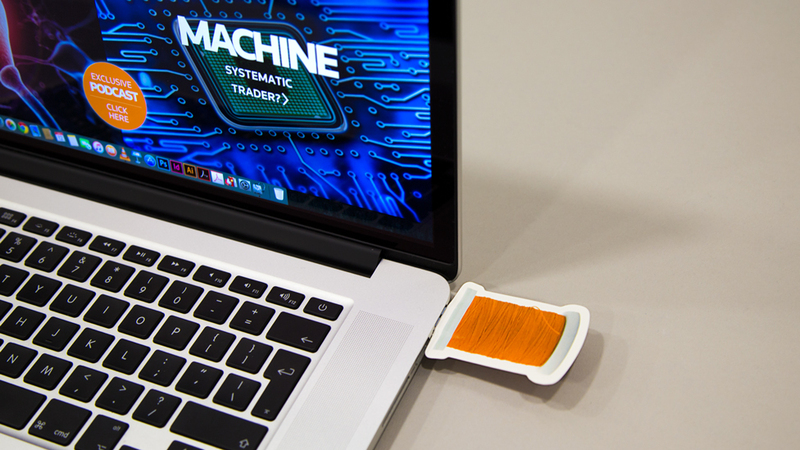 A bespoke web key in the shape of a spool of thread was included in the initial mailer to further emphasise the “tailored” approach of the product, and link recipients directly to Man vs. Machine microsite. Use of the web key was easily trackable. 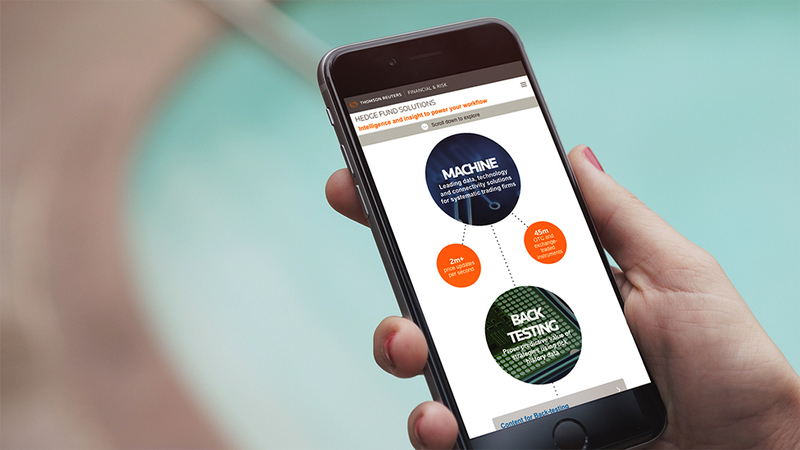 Email Campaign – Six emails were developed to coordinate with the direct marketing material to drive traffic to the microsite and promote the latest Man vs. Machine podcast episode. Direct mail pieces and emails were alternated throughout the campaign to target different individuals at key times, and maximise engagement with the website. They also provided a regular reminder of the new content available on the Man vs. Machine website: each channel supported the other for maximum impact and awareness. Programmatic Digital Banners – Used to target the hedge fund community through prospecting on relevant websites and retargeting thereafter. 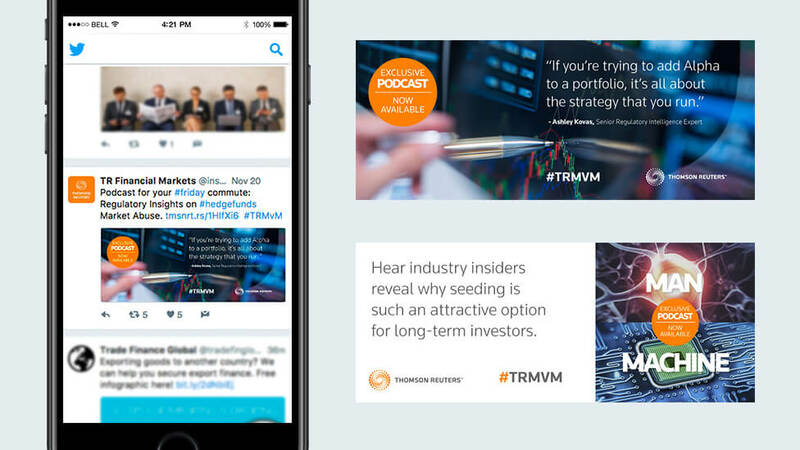 Programmatic digital banner ads targeted members of the hedge fund community on relevant financial websites, helping to drive them directly to the Man vs. Machine microsite. Once the initial prospecting occurred, ads were retargeted to continue driving traffic to the microsite through return visits – a cost-effective way to maximise the strict advertising budget. 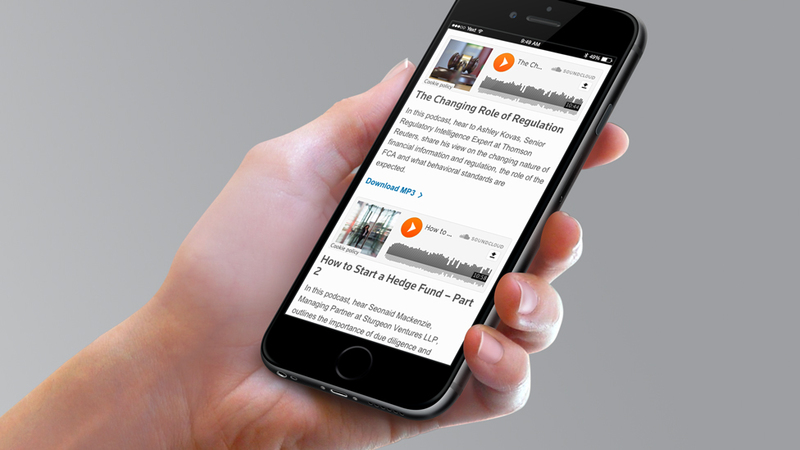 Social Media – We developed relevant social media content for Twitter and LinkedIn to engage with the hedge fund community and generate interest in the latest podcast episodes, driving traffic directly to the microsite. Social media content was successfully used as a teaser to entice hedge fund managers to check out episodes they might have missed the week before. It also made it easy for the target audience to share content with one another.